“Most writers MUST have a day job. Before King hit it big he lived in a trailer, wrote in the water heater closet, and taught school. He was not a successful writer and he was ready to give it all up when lightning struck. I’m still waiting for that to happen to me. We all are.” –anonymous. I’ve been swinging a dream like a hammer for years. I create. That’s what I do. I write. I photograph. I paint. I’m trained to do so. I hope one day my creations will go into the world and bring back a better job, one with tenure, more laptop time in a mountain cabin, a book tour. I crave freedom, expansion, abundance, and more life in my living, and of course, more time to write. I want all of this, plus I want my creations, especially my writing, to be of twin service: entertainment and transformation. I want my audience to enjoy what they’re reading, and be challenged within their own awareness. Who has time to digest words anymore? To build an audience is nearly impossible in this day of closing bookstores and #hashtag blogs. For struggling artists like me, this karma of being the best-kept secret may never change no matter how gifted, how many years devoted to training, or how close I am to grasping the brass ring of the BIG TIME. Not being seen is a painful experience—not just for an artist—but also for all living things. In part, art relies on the energetic reciprocity of the other–the viewer, the listener, and the sensor. Only through this relationship is the life force breathed into the creative process and inspiration’s divine spark communicated into the world. Without an audience, creations die on the vine in the form of yellowed manuscripts, warehoused paintings, corrupted floppy disks, and if one is almost famous, museum basement archives. With each rejection, the motivation to continue to work becomes more challenging. Rejection isn’t even rejection anymore—it’s a type of ghost-like invisibility. There was a time when the solicited would respond with a letter, hand written if they were very sorry for not accepting. Nowadays, there’s often no letter, rather, a cyber-space purgatory, the pit of nothingness where ones work goes but never returns. I’ve witnessed the fallout of talented comrades along the way who were unable to endure this virtual Bermuda’s Triangle. This slow death of the artist is often not due to a lack of effort or talent. It’s lack of reciprocity. Without an audience, art holds little meaning, and without art culture lacks an alchemical change agent. Yes, we can get full on fast food and pop music, but we all know that this lack of substance makes us sick over time. For the artist, without reciprocity, one’s rice bowl is empty and such soul starvation is not worth the effort to create. As a culture, it’s easy to become numb, and passive. There’s no time to slow down and digest meaning that would demand too much attention–bring on the Happy Meal and the non-news, bring on the sound byte. The world speeds forward, and we are powerless to slow down to reflect on who we really are. How does the artist stay motivated against such obstacles? I believe that as an artist, I’ve had to learn to dissolve identity into the process of creation itself, which includes metaphorically dying. Not because there are any rewards to this process, but because the world needs people to remember how this is done. All of us, whether an artist or not, must let go of the passions we once held. Sometimes, this means letting go of the Artist’s identity. Done well, a person goes on to become something else, and create in a different way. Done poorly, the unused gift becomes a poison. For me, transmutation lies within these questions: How does one transform pain into creativity? How does one let go of the dream without letting go of the creative fire? How does one stay motivated when there’re very few tangible, external rewards? I believe pain can be alchemically transformed. To do this, one must choose a path(s)—any path and practice. The more one can let go of who they think they are the more one accepts transcendent and transitory nature of being. Thus, if an artist is to continue working without rice in their bowl, they must discover a way to become the bowl itself. Like the Buddhist and Navajo priests who construct the most exquisite sand mandalas only to be released as a prayer to the water and wind. Like the songbird that bursts into song because it is the song. There can be no separation from Creative Mind, and no attachment to outcome. Doing so, the desolate mile is filled with joy. There’s no holding, only letting go. That alone must be enough. This is by no means easy—it’s called ‘practice’ for a reason, and for most of my life I’ve resisted such wisdom teachings because of my dogged attachment to progress and outcome, which has created more psychological distress. Through my practice of radical self-acceptance, I’m learning rejection’s transformational nature—the courage to let go and begin again. If I am unable to let go, or change the nature of my suffering, then any possibility of new creativity, new growth, is blocked. The following anecdote in Lesson of the Swan is an example of I how I used my spirituality in this ‘alchemical’ transformational process. I’ve sought mystical experiences, and one path that lends itself to such exploration is Shamanic Dream Journeys. In a Shamanic Dream Journey, the intensive drumbeat drives the conscious mind into an altered state. It’s very much learning the art of lucid dreaming, and tapping into the archetypal language of the natural world. I’ve often brought a question, or intention, to the ceremony and allowed the dream to inform meaning. On this night, I brought forth my question: How do I transform rejection? 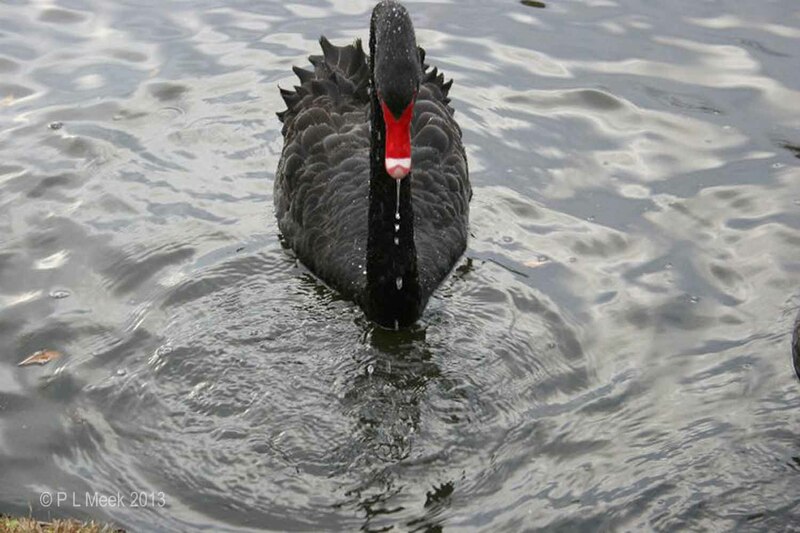 A black swan emerged from the dream journey, angry at first, but quickly morphed into a ballerina. She danced. Theater seats were empty. She danced anyway. Little by little, attracted to her dance, the dark theatre filled. I was reminded to dance my dance, and make it not my business who watches. In the following days, several more artistic expressions emerged; including another poem in a series about Georgia O’Keeffe called the Feast For the Dead. Once again, I experienced the joy of reconnecting to my deeper, authentic self. My pain became the raw material for new creativity, something extraordinary. By learning to accept life for what it is, and practicing radical self-acceptance, the distortions in my heart and mind dissolved—at least for that moment. Once again my bowl filled with spiritual food and my spirit was satisfied. The Lesson of The Swan. Jim held the Abalone shell, and fanned the sage with an adorned Eagle feather, a gift from pueblo elders. No Anglo person I’d known had ever been invited into the ancient Kiva ceremonies—Jim was the exception and it was a great honor. This Midwesterner had become a Shaman over the years, and one of the truest healers I’ve ever encountered over the two decades I’ve been a seeker. Tonight, he had an assortment of offerings for the spirits: corn meal, tobacco leaves, Palo Santo (a sacred, aromatic wood), sweet grass, and sage. Smoke billowed, draped the windows and doors, dissipated, and cleansed the room as Jim systematically smudged the entry points. His silent prayers prepared the way for spirit by creating intention and welcoming. He’d traveled across the San Luis Valley to hold a Shamanic Drum ceremony at our home in Alamosa, a Wild West outpost, where a few friends and co-workers sat on floor pillows. He was on his way to Boulder where another group waited to be led in ceremony. Many of the participants had never done a Shamanic Journey. “Creative visualization—like dreaming. A mediation of sorts,” I’d said. “No,” I sighed, as this is usually the first question asked in regards to indigenous ceremonies. It’s not that many people don’t find higher consciousness through plant medicines, and receive a great healing benefit, but I’ve always felt that mind-altering substances promote a spiritual by-pass. Personally, I want to be able to ingrate phenomenon and in order to do that, I need a clear mind. No one spoke as Jim continued to prepare the room, but I could feel the curiosity and anticipation as he moved about with ease and purpose. He looked like a Shaman with his life-map lines on his weathered face, hair pulled back, and piercing eyes accustomed to peering into the veil; once a civilized man on gravy-train road like most of us who dissolve into numbness between the hours of 8 and 6. He’d opened his heart despite untold pain and found a return to his indigenous nature through the process of initiations and dying to the self. The room smelled like healing, and my body calmed. My spirit jumped, happy, ready. Working in the mental health industry, there’s not a lot of time to practice what I coach—make time for self-care, make time for my spirit. I needed to clear the suffering that I’d witnessed over the past several months; some of that suffering was my own. While on a trip to Ghost Ranch, I’d written a divinely inspired poem. I’d felt Georgia O’Keeffe’s energy move through me and craft a poem beyond my ordinary ability. I seldom enter writing contests because I’ve experienced failure too many times. But I’d recognized the judge’s name, a person, who– like me–had an affinity for the Southwest desert, an understanding for mysticism, and an appreciation for Georgia O’Keeffe. This time, my work had a chance. Out of 300 hundred anonymous entries, there was one winner, and six runners-up. I discovered this on the official website long after a rejection letter should have arrived. That’d been my best shot in a long time to have such a gift received by a larger audience. Success was beyond my effort, and I was hurt. The bitter fruit of anger hurt even worse, and I had to release the internal tantrum, or be consumed. I was the last to receive the feather blessing and so had the honor of blessing and welcoming Jim. I accepted the shell and the eagle feather, and with some awkwardness, fanned the sage from his feet to his head. I used the feather to slice through the air, imitating his sweeping motion. “Welcome, Jim,” I smiled as I gently touched the feather to his heart. He thanked me, and we then returned to our places on the floor, while he sat on our blood-red chair, ceremonial drum between his feet, and instructed us on shamanic journeys. We took one more moment to go to the bathroom, get a drink of water, before settling onto our blankets we’d stretched across the floor. Jim struck the first steady beat. The beat became the voice. The voice sang me into a trance. At first my mind resisted. I was aware I was lying on the floor. I was aware my chest vibrated. I was aware I was breathing. I was aware of my mind. I became aware of shadows–the animals had arrived, and I drifted into a lucid dream. First to emerge from the darkness was my power animal, rabbit. In my first journey, rabbit appeared to me as a giant Hare, ears stretched into the star-lit cosmos like antennae. Rabbit: the mystical, sensitive being that appears and disappears into the legends of Celtic fog. Rabbit: affirmation that I’m on my path, and my teacher of how to be sensitive and survive this planet. Rabbit morphed into a raven and the raven flew with me only to become a wolf that ate me. I became the wolf and knew the power of intense focus. Each animal morphed into another, each carrying a symbolic message. I can’t tell you how long I traveled between space and time. I was transported through the dark into the light and back to the dark. From the shadow emerged sparkles on a lake. They twinkled like stars, and from the stars emerged a black swan, blood-red beak, feathers like obsidian–a beautiful blue-blackness–a terrible and awe-inspiring creature as dark as the deepest night. The Swan was angry, and with a mighty beat of its wings, rose up and confronted me with a forceful honking like a scream. At first I didn’t understand, but as Jim instructed, I asked although I wasn’t aware of the question. Fluid knowing returned to me. This was my creative nature. It was angry. I was angry. Nature was angry. How often has the animal world been discarded? I thought about the black swan shot on my parents’ lake. The elderly man with the gun said he was trying to shoot squirrels. Nothing is sacred, not even the sacred. How to continue to create when no one cares about the creation? How do I transform this pain? The angry swan stopped honking and changed into a ballerina. The lake dissolved into a darkened stage with this solitary dancer elegantly balanced and spinning on pointed toe. Dressed in black tulle, I recognized her to be the swan. She was breathtaking as she spun and leapt with sheer joy. I was in the shadows, the invisible observer, a shade, and saw row upon row of empty theater seats. She danced for no one, and as I watched, I knew she was too absorbed in her dance to care. I became aware of other ghostly shades as they drifted into the room. Quickly, the seats began to fill with the presence of ghosts. Suddenly, an audience filled the room, responding to the recognition of themselves twirling on stage. The ballerina single-mindedly became one with the divine. She was life itself. The ghosts had lost their ability to commune with God but had not lost their desire or need. Being free of identity, the ballerina and the ghosts could became ONE in the dance. They were both in the nature of God. This is the Lesson of the Swan.